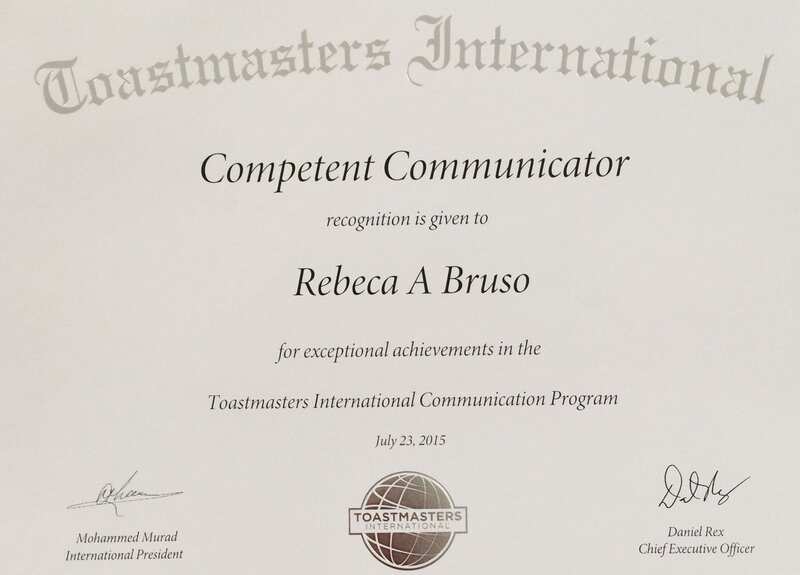 For the non-toastmaster folks, what this means is that I authored and prepared, practiced, and delivered 10 speeches at my local Toastmaster Club. Not only was I able to practice and improve my public speaking skills, but immediately after each of these ten speeches, I received the gift of being critiqued by my fellow club members. This critique, formally called an evaluation, is the opportunity for those delivering a speech and the other club members to give and receive. In my case, I received invaluable information about what elements of my speech were effective and which were not. Fellow toasties (as we call each other in Sturbridge, MA) get to practice delivering constructive feedback. In addition to honing my public speaking skills, this experience has also added to my ablity to stick with long range projects and produce results. There are guidelines and types of speeches to follow and after delivering ten of these from the Competent Communicator Manual, I was able to receive this certificate of recognition. The Village Toastmaster’s Club is a local Toastmaster International Club which meets weekly and follows the program put together by Toastmaster’s International. Becky Bruso is the owner and found of The BizPal Company, LLC. A provider of website, social media, and email marketing services. The BizPal Company, LLC works on project of all shapes and sizes. Whether you just need help to solidify your idea or plan or want more guidance to work with you side by side to make your project a success, we can help! You can count on us to deliver reuslts whether meeting in person or remotely! A note from Becky at The BizPal Company, LLC: We continually upgrade our knowledge and skills by attending new classes and evaluating software which helps run small businesses. Toastmasters is a weekly forum where like-minded members meet to practice and improve their public speaking skills.